Sodium chloride is composed of Na+ and Cl− ions arranged in a three-dimensional array ( FIGURE 8.3). The arrow indicates the transfer of an electron from the Na atom to the Cl atom. Each ion has an octet of electrons, the Na+ octet being the 2s22p6 electrons that lie below the single 3s valence electron of the Na atom. We have put a bracket around the chloride ion to emphasize that all eight electrons are located on it. If no color key were provided, is there a way for you to guess whether the green spheres represent Na+or Cl−? If so, what information would you use? FIGURE 8.3 The crystal structure of sodium chloride. Describe the electron transfers that occur in the formation of calcium fluoride from elemental calcium and elemental fluorine. Ionic substances possess several characteristic properties. They are usually brittle substances with high melting points. They are usually crystalline. Furthermore, ionic crystals often can be cleaved; that is, they break apart along smooth, flat surfaces. These characteristics result from electrostatic forces that maintain the ions in a rigid, well-defined, three-dimensional arrangement such as that shown in Figure 8.3. The formation of sodium chloride from sodium and chlorine is very exothermic, as indicated by the large negative enthalpy of formation value given in Equation 8.1, . Appendix C shows that the heat of formation of other ionic substances is also quite negative. What factors make the formation of ionic compounds so exothermic? 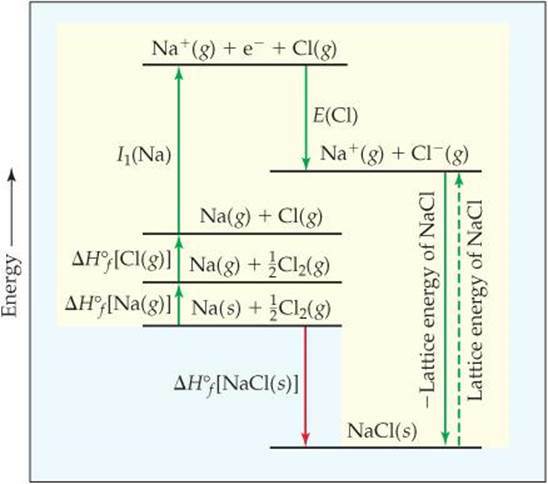 In Equation 8.2 we represented the formation of NaCl as the transfer of an electron from Na to Cl. Recall from Section 7.4 that the loss of electrons from an atom is always an endothermic process. Removing an electron from Na(g) to form Na+(g), for instance, requires 496 kJ/mol. Recall from Section 7.5 that when a nonmetal gains an electron, the process is generally exothermic, as seen from the negative electron affinities of the elements. Adding an electron to Cl(g), for example, releases 349 kJ/mol. From the magnitudes of these energies, we can see that the transfer of an electron from a Na atom to a Cl atom would not be exothermic—the overall process would be an endothermic process that requires 496 − 349 = 147 kJ/mol. This endothermic process corresponds to the formation of sodium and chloride ions that are infinitely far apart—in other words, the positive energy change assumes that the ions do not interact with each other, which is quite different from the situation in ionic solids. Consider the trends in ionization energies of the alkali metals and electron affinities of the halogens shown in Figures 7.9 and 7.11. For which pair is electron transfer from the alkali metal atom to the halogen atom most likely to be an exothermic process? The principal reason ionic compounds are stable is the attraction between ions of opposite charge. This attraction draws the ions together, releasing energy and causing the ions to form a solid array, or lattice, such as that shown in Figure 8.3. A measure of how much stabilization results from arranging oppositely charged ions in an ionic solid is given by the lattice energy, which is the energy required to completely separate one mole of a solid ionic compound into its gaseous ions. Notice that this process is highly endothermic. The reverse process—the coming together of Na+(g) and Cl−(g) to form NaCl(s)—is therefore highly exothermic (ΔH = −788 kJ/mol). 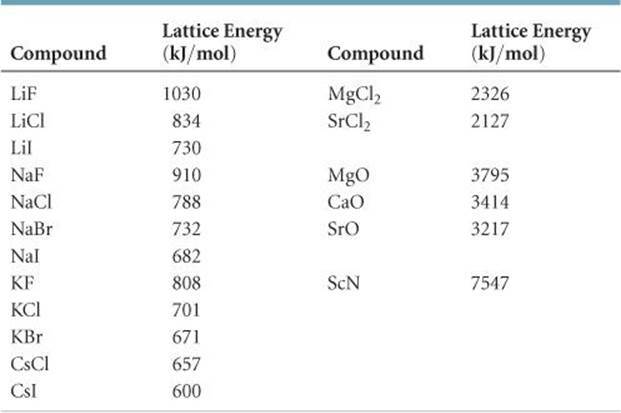 TABLE 8.2 lists the lattice energies for a number of ionic compounds. 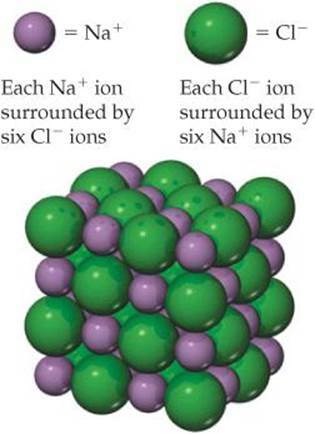 The large positive values indicate that the ions are strongly attracted to one another in ionic solids. The energy released by the attraction between ions of unlike charge more than makes up for the endothermic nature of ionization energies, making the formation of ionic compounds an exothermic process. The strong attractions also cause most ionic materials to be hard and brittle with high melting points—for example, NaCl melts at 801 °C. In this equation Q1 and Q2 are the charges on the particles, d is the distance between their centers, and κ is a constant, 8.99 × 109 J-m/C2. Equation 8.4 indicates that the attractive interaction between two oppositely charged ions increases as the magnitudes of their charges increase and as the distance between their centers decreases. Thus, for a given arrangement of ions, the lattice energy increases as the charges on the ions increase and as their radii decrease. The magnitude of lattice energies depends predominantly on the ionic charges because ionic radii vary over only a limited range. Without consulting Table 8.2, arrange the ionic compounds NaF, CsI, and CaO in order of increasing lattice energy. Analyze From the formulas for three ionic compounds, we must determine their relative lattice energies. Plan We need to determine the charges and relative sizes of the ions in the compounds. We then use Equation 8.4 qualitatively to determine the relative energies, knowing that (a) the larger the ionic charges, the greater the energy and (b) the farther apart the ions are, the lower the energy. Solve NaF consists of Na+ and F- ions, CsI of Cs+ and I- ions, and CaO of Ca2+ and O2- ions. Because the product Q1Q2 appears in the numerator of Equation 8.4, the lattice energy increases dramatically when the charges increase. Thus, we expect the lattice energy of CaO, which has 2+ and 2- ions, to be the greatest of the three. The ionic charges are the same in NaF and CsI. As a result, the difference in their lattice energies depends on the difference in the distance between ions in the lattice. Because ionic size increases as we go down a group in the periodic table (Section 7.3), we know that Cs+ is larger than Na+ and I- is larger than F-. Therefore, the distance between Na+ and F- ions in NaF is less than the distance between the Cs+ and I- ions in CsI. As a result, the lattice energy of NaF should be greater than that of CsI. In order of increasing energy, therefore, we have CsI < NaF < CaO. Check Table 8.2 confirms our predicted order is correct. Which substance do you expect to have the greatest lattice energy, MgF2, CaF2, or ZrO2? 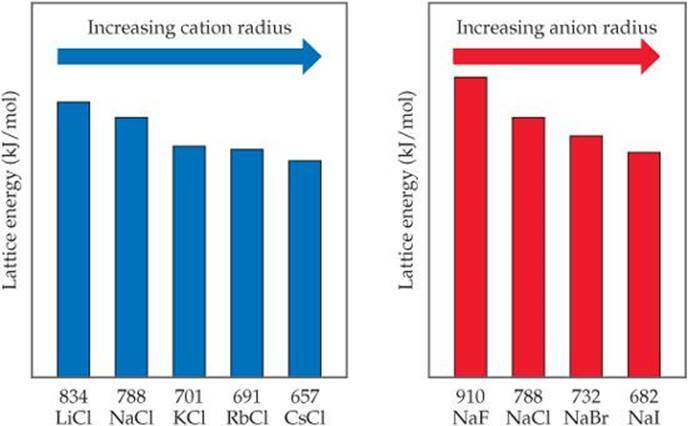 Using this figure, can you place an upper and lower limit on the lattice energy of KF? FIGURE 8.4 Periodic trends in lattice energy as a function of cation or anion radius. Because lattice energy decreases as distance between ions increases, lattice energies follow trends that parallel those in ionic radius shown in Figure 7.6. In particular, because ionic radius increases as we go down a group of the periodic table, we find that, for a given type of ionic compound, lattice energy decreases as we go down a group. FIGURE 8.4 illustrates this trend for the alkali chlorides MCl (M = Li, Na, K, Rb, Cs) and the sodium halides NaX (X = F, Cl, Br, I). Even though lattice energy increases with increasing ionic charge, we never find ionic compounds that contain Na2+ ions. The second electron removed would have to come from an inner shell of the sodium atom, and removing electrons from an inner shell requires a very large amount of energy. (Section 7.4) The increase in lattice energy is not enough to compensate for the energy needed to remove an inner-shell electron. Thus, sodium and the other group 1A metals are found in ionic substances only as 1+ ions. To form a Cl2- ion, the second electron would have to be added to the next higher shell of the Cl atom, an addition that is energetically very unfavorable. Therefore, we never observe Cl2- ions in ionic compounds. We thus expect ionic compounds of the representative metals from groups 1A, 2A, and 3A to contain 1+, 2+, and 3+ cations, respectively, and usually expect ionic compounds of the representative nonmetals of groups 5A, 6A, and 7A to contain 3−, 2−, and 1− anions, respectively. Lattice energies cannot be determined directly by experiment. They can, however, be calculated by envisioning the formation of an ionic compound as occurring in a series of well-defined steps. We can then use Hess's law (Section 5.6) to combine the steps in a way that gives the lattice energy for the compound. By so doing, we construct a Born-Haber cycle, a thermochemical cycle named after the German scientists Max Born (1882-1970) and Fritz Haber (1868-1934), who introduced it to analyze the factors contributing to the stability of ionic compounds. Note that both processes are endothermic. FIGURE 8.5 Born-Haber cycle for formation of NaCl. This Hess's law representation shows the energetic relationships in the formation of the ionic solid from its elements. Thus, the lattice energy of NaCl is 788 kJ/mol. Predict the ion generally formed by (a) Sr, (b) S, (c) Al. Analyze We must decide how many electrons are most likely to be gained or lost by atoms of Sr, S, and Al. Plan In each case we can use the element's position in the periodic table to predict whether the element forms a cation or an anion. We can then use its electron configuration to determine the most likely ion formed. Solve (a) Strontium is a metal in group 2A and therefore forms a cation. Its electron configuration is [Kr]5s2, and so we expect that the two valence electrons can be lost easily to give an Sr2+ ion. (b) Sulfur is a nonmetal in group 6A and will thus tend to be found as an anion. Its electron configuration ([Ne]3s23p4) is two electrons short of a noble-gas configuration. Thus, we expect that sulfur will form S2- ions. (c) Aluminum is a metal in group 3A. We therefore expect it to form Al3+ ions. Check The ionic charges we predict here are confirmed in Tables 2.4 and 2.5. Predict the charges on the ions formed when magnesium reacts with nitrogen. What would happen to the magnitudes of the attractions and repulsions represented in (a) if the nuclei were farther apart? FIGURE 8.6 The covalent bond in H2. (a) The attractions and repulsions among electrons and nuclei in the hydrogen molecule. (b) Electron distribution in the H2 molecule. Because ionization energies increase rapidly for each successive electron removed, the lattice energies of ionic compounds are generally large enough to compensate for the loss of up to only three electrons from atoms. Thus, we find cations with charges of 1+, 2+, or 3+ in ionic compounds. Most transition metals, however, have more than three electrons beyond a noble-gas core. Silver, for example, has a [Kr]4d10 5s1 electron configuration. Metals of group 1B (Cu, Ag, Au) often occur as 1+ ions (as in CuBr and AgCl). In forming Ag+, the 5s electron is lost, leaving a completely filled 4d subshell. As in this example, transition metals generally do not form ions that have a noble-gas configuration. The octet rule, although useful, is clearly limited in scope. Recall from Section 7.4 that when a positive ion forms from an atom, electrons are always lost first from the subshell having the largest value of n. Thus, in forming ions, transition metals lose the valence-shell s electrons first, then as many d electrons as required to reach the charge of the ion. For instance, in forming Fe2+ from Fe, which has the electron configuration [Ar]3d6 4s2, the two 4s electrons are lost, leading to an [Ar]3d6 configuration. Removal of an additional electron gives Fe3+, whose electron configuration is [Ar]3d5. Which element forms a 3+ ion that has the electron configuration [Kr]4d6?